Analyzer.Tools allows the processing and analyzing of bulk product lists by loading an Excel product list into the program. This is a powerful tool that can process up to ~16,000 products per hour and deliver critical data to determine if a product is profitable and much much more. In order to begin, you will need an Excel product list from a supplier (the “Spreadsheet”) that meets the required column data and Spreadsheet formatting requirements as explained in the sections below. 3. Select your options, click “Load”. 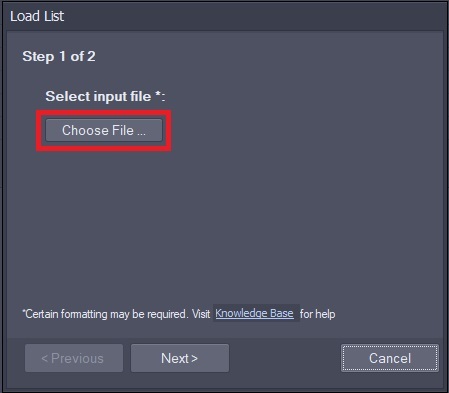 E: Contains Header: If your Spreadsheet has headers, select this checkbox. If not, un-select. Click Run and you will see data start to pour into the Results tab! *Video shows an older version of the software but general functionality is the same. Each input file should only contain one type of Product ID in the same column with the exception of UPCs and EANs which CAN be mixed. Mixing other IDs such as UPC and ASIN in same column is not recommended for accurate results. 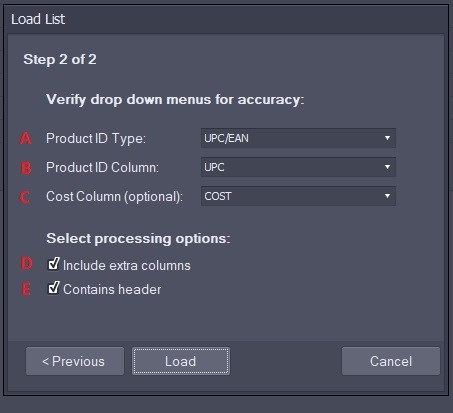 Valid Product IDs such as UPC, EAN, ASIN or ISBN are required in a Spreadsheet in order for Analyzer.Tools to search and match products to the Amazon database. Purchase Price from supplier (commonly referred to as cost of goods sold) is not required but highly recommended in order to accurately analyze Profit, ROI, etc.